Wine Ch. 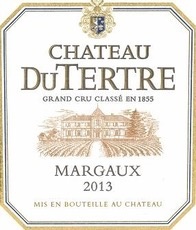 du Tertre 2013 - Royal Wine Merchants - Happy to Offer! Ch. du Tertre was bought by Eric and Louise Albada Jelgeresma, owners of nearby Ch. Giscours (separated by Ch. du Tertre by only a small stream). Wines are vinified in a combination of wood tanks, concrete vats, cement eggs and stainless steel tanks, allowing for individual parcel-by-parcel vinification. Following fermentation in a mix of French oak barrels and vats, the wine is aged for an average of 18 months in 50% new French oak.